It began long ago when I was a child, with my parents encouragement I began expressing myself through art by painting, drawing and even sculpting with clay. My love of art grew with the help of teachers along the way. I now teach and have my own company with my husband, Mike. Through teaching at Great Walls Supply and The Couture Collection! I have found my passion for creative expression. At a Great Walls we have been teaching decorative artists designer wall finishes. At The Couture Collection! we teach painted furniture and cabinet techniques. I want to share my love of painting with you! 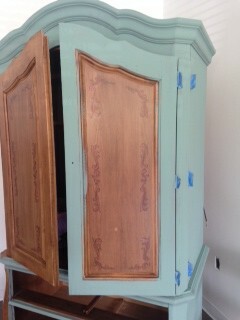 I had this armoire for about 15 years and she needs an update. I will use these Paint Couture! Colors: Abundance, Angelic & Dream. I want to add a little texture to make this piece looked European and aged. 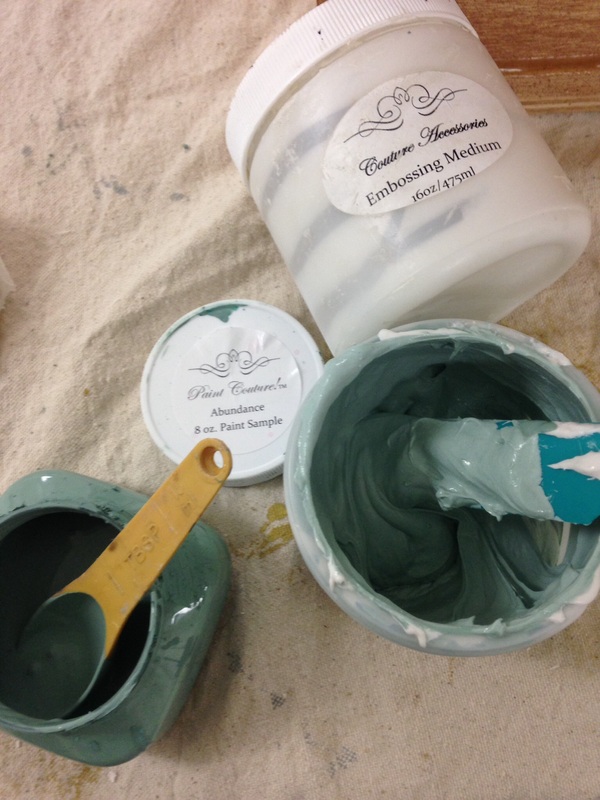 For this I will use Couture Embossing Medium and Glaze Couture! Let’s get started! Remove the hardware. Put the screws and washers back on the pulls and label which drawer they call home. Clean the piece using diluted Simple Green and scrub with terry towel. 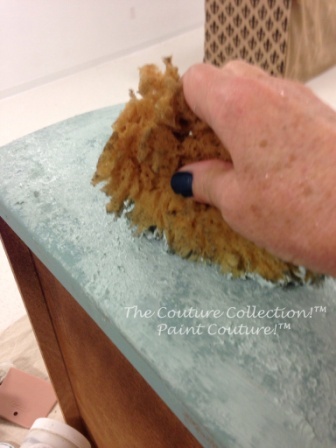 No sanding or priming is necessary with Paint Couture! but cleaning is very important for good paint adhesion! You will be amazed at how dirty your towel will be. Let it dry and you are ready to paint. I plan out my colors. In my studio all our colors are painted on cabinet doors and displayed on our wall for all to see. I use small pieces of molding and wood to play with other color combinations, here I mixed Angelic and Dream together to make a soft blue grey, very European looking. 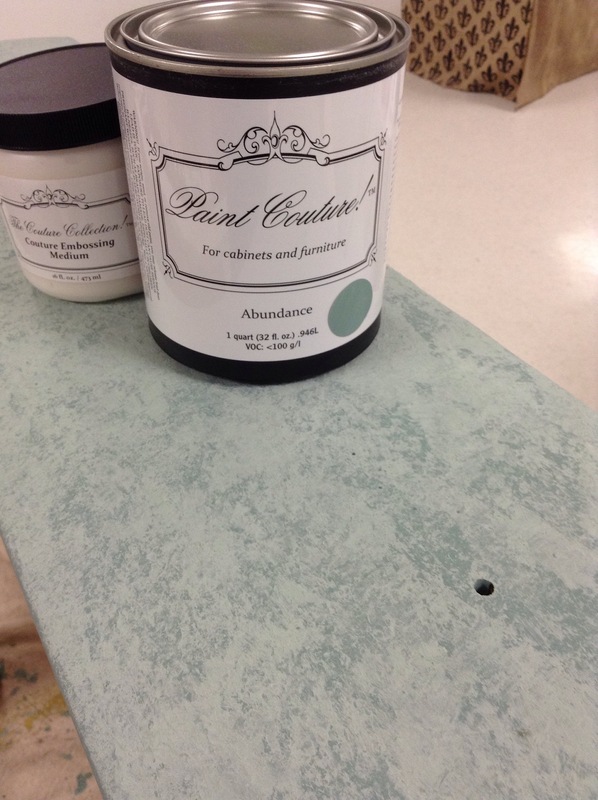 I will use Abundance Paint Couture! as my base paint. I plan to layer colors. Apply Abundance with a good quality brush, I like Zibra brushes. I am using a Zibra 2″ Sash Brush, great for acrylic paints! Paint Couture! is a 100% acrylic paint and very durable. It goes on smooth and dries flat with no brush marks. 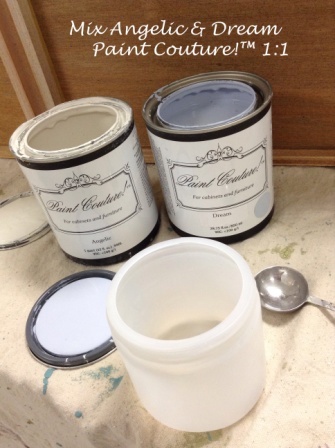 It is more durable than a chalk type paint and easy to use! Dry to the touch in about an hour. Because I will be distressing this piece I can now go on to the next step. If I am just painting and glazing I wait 24 hours between coats. 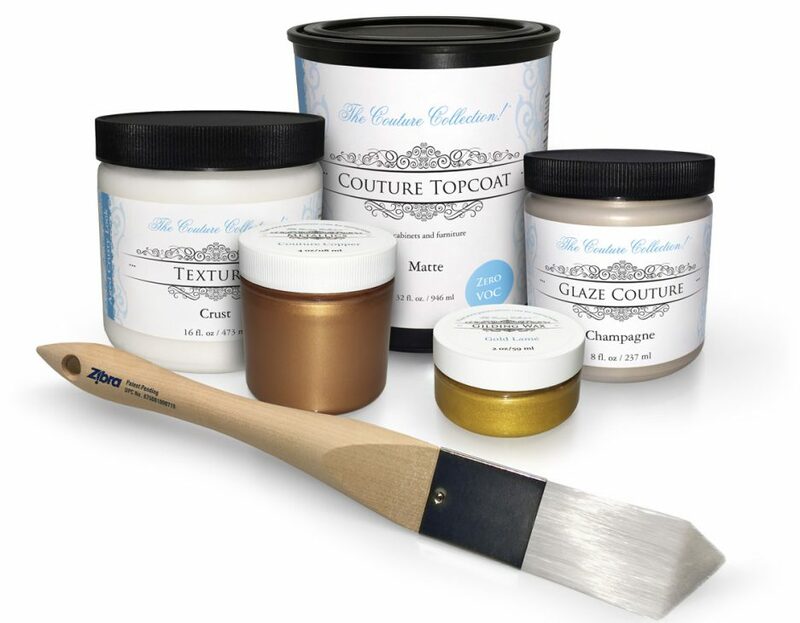 Mix 16 oz Embossing Medium with 3 tablespoons Abundance Paint Couture! 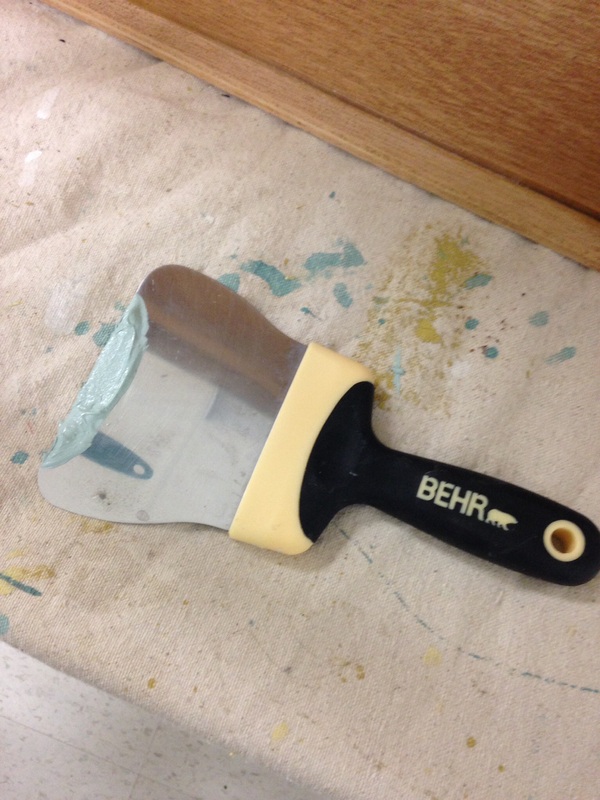 Now apply the colored Embossing Medium with the Behr Trowel. To add more depth now apply the tinted Embossing Medium with a Sea Sponge. This will create more texture build up that will look very natural! Apply tinted Embossing Medium with Sea Sponge by pouncing on the surface. Do not get thick, move the product around so you have some light texture. 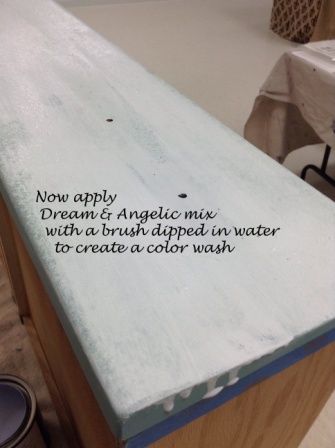 When the Embossing Medium has dried, mix Angelic and Dream Paint Couture! in a 1 to 1 ratio. I dipped my paint brush in water, then into the paint and spread the mixture across the drawer. I added more water to make this a Color Wash. A Color Wash is thin and you can see through it to the base color. I put the drawer back to see if I liked the progress! Next post will be about Distressing Painted Furniture and Glazing. I will continue today taking you through the steps for my painted armoire, and do a little sideline about distressing furniture. Here I am doing Wet Distressing. Instead of sand paper I use a dampened Scotch Brite sponge. 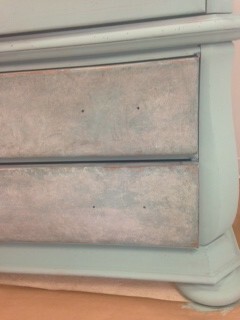 Wet Distressing allows you more control over removing paint, and there is no dust from sanding! You will need a container of water and Scotch Brite scrub sponges, I like the yellow version. Buy the good brand, not imitations, because those less expensive brands fall apart quickly and can shed on your work. Taking a little side trip to show you Wet Distressing on a cabinet door I painted. This door is base painted in Lake Norman Signature Blue Paint Couture!, which I let dry overnight, then painted with Spanish Sunrise. Let the blue base coat dry about 24 hours, otherwise it will remove too easily with the damp sponge. You can let it dry longer if desired. I painted the second coat with Spanish Sunrise. You can see it is not perfect, and that is fine because I am going to distress it! After The Spanish Sunrise has dried about 1 hour, use the damp yellow sponge side and begin dragging it across the surface. Gentle pressure at first, until you get the feel for it and see the results you want. Do you see the blue coming through? This is an easy and fun technique! 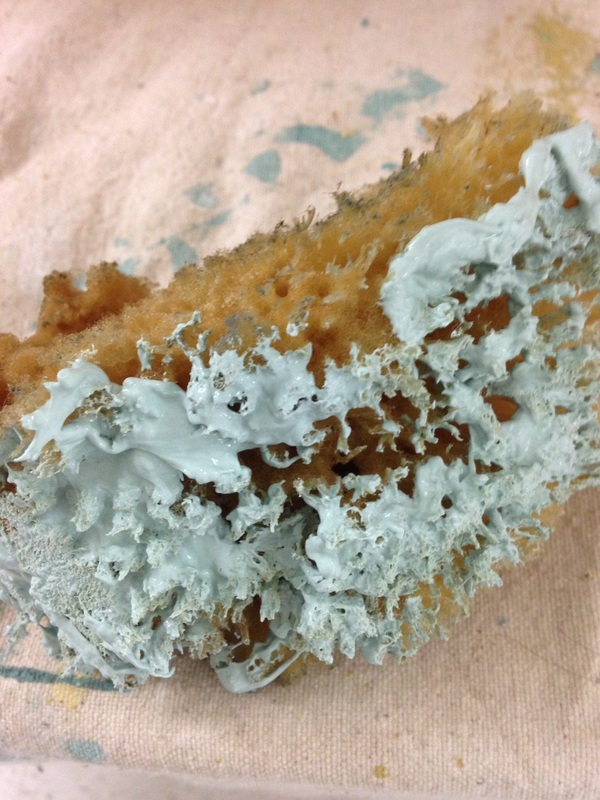 To remove more paint turn the sponge over and use the green scrub side! Now back to my armoire drawers… Distressing just around the edges. I am not going for the heavily distressed shabby look here, but a time worn European look. Be careful not to dip the sponge in your coffee! I placed the drawer pulls back on just to check the look (just lay them down no need to screw them back in yet). See how the paint looks worn away a bit behind the handles, this is where hands have gripped those pulls over the years. I am happy with the look and so is my little cutie, Bali Boo. Next I apply 1 coat of Lacquer Couture! Dead Flat. This is a water based top coat and I sometimes use it as a “barrier coat” in between paint and glaze. Why? I want to use Black Chiffon Glaze Couture!, but I want it to appear lighter. 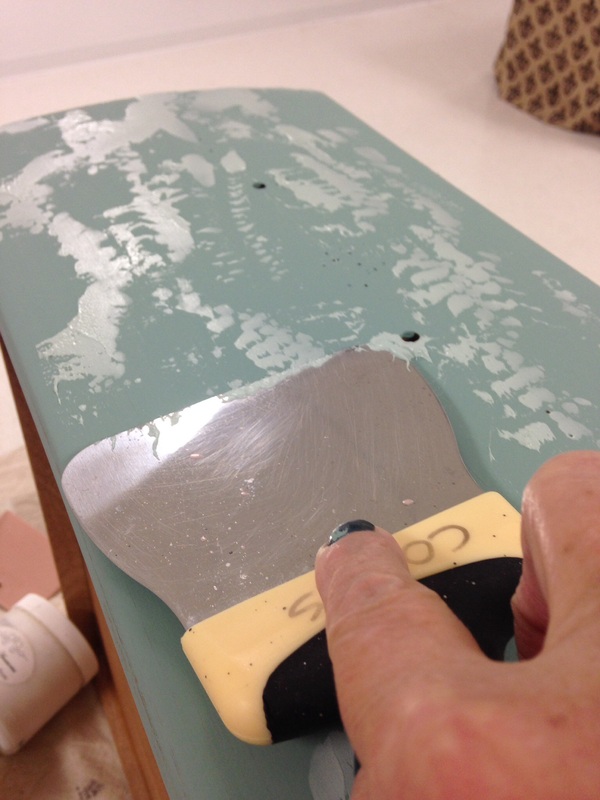 The coat of lacquer will prevent the glaze from grabbing the paint and will keep the glaze color lighter. Apply the lacquer with a good quality soft brush. I am using the Zibra Sash Brush. Let the lacquer dry 4 hours. Next apply Black Chiffon Glaze Couture! With a chip brush. Put on a good medium thick layer. You want the glaze to be wet. Use a lint free cotton rag to remove the glaze, you will need several. I have found the best lint free rags sold from Porter Paints. I wash them and use them over and over. Scrunch up the rag and blot the glaze off. This is called “ragging off”. You can also use a cheesecloth to remove the glaze for this technique. You will have a few minutes to remove the glaze. Do not over work it, you will feel it start to dry and become sticky, then you know it is time to stop. Allow the glaze to dry 24 hours. 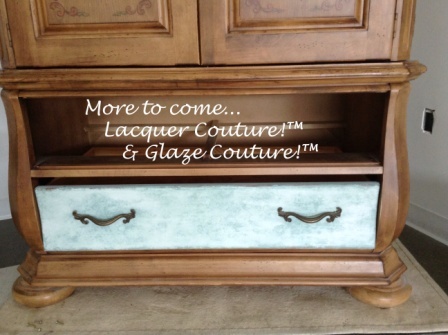 Painted and glazed armoire drawers using Paint Couture! and Glaze Couture! Abundance Paint Couture! 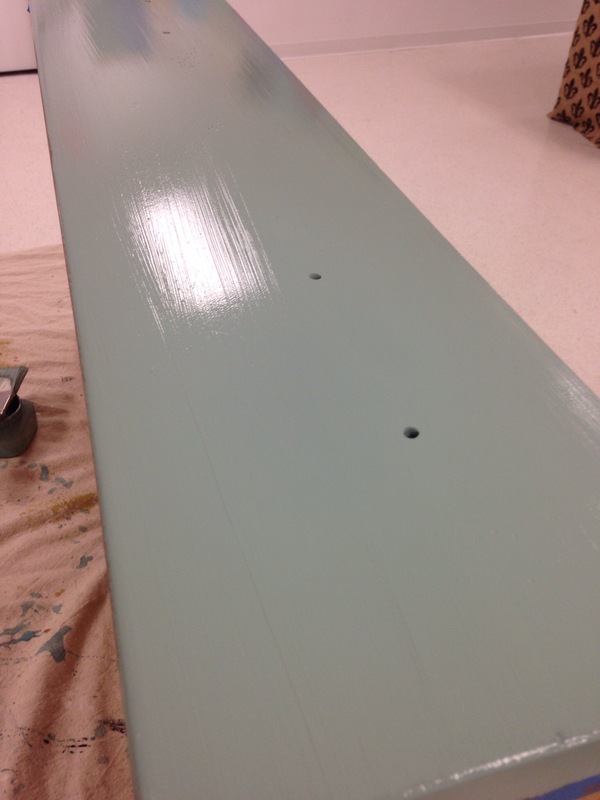 first coat being painted on armoire. No priming, no sanding! When I was young with my parents encouragement I began expressing myself through art by painting, drawing and even sculpting with clay. My love of art grew with the help of teachers along the way. I now teach and have my own company with my husband, Mike. Through teaching at Great Walls Supply and The Couture Collection! I have found my passion for creative expression. At a Great Walls we have been teaching decorative artists designer wall finishes. At The Couture Collection! we teach painted furniture and cabinet techniques to both customers and our Retailers. We sell our paints, glazes and topcoats to Retailers throughout North America. I want to share my love of painting with you!